Looking for hotels near Mount Tapyas? Located in Coron, 3.2 miles from Twin Lagoon and 3.3 miles from Kayangan Lake, Aquilah Homestay provides mountain views and free WiFi. All units feature air conditioning and a flat-screen TV. Offering free WiFi and mountain views, Haisa Apartment provides accommodations located in Coron, just a 9-minute walk from Coron Public Market. Guests have a private terrace. 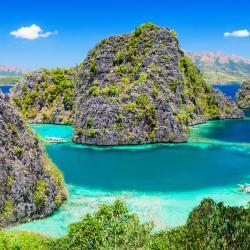 Located 4.3 mi from Kayangan Lake, Charms Hotel provides accommodations with free WiFi in Coron. Located in Coron within 4-minute walking distance from Coron Public Market and 15-minute walk from Mt Tapyas, The Bay Area Coron features a garden with seating area and free WiFi. Located in the Palawan city of Coron, MO2 Westown Lagoon Coron offers an in-house restaurant and bar just 5.6 mi from Kayangan Lake. Great Facilities. Very comfortable stay for 3 nights. The staff were very accommodating. Housed in a 3-story builidng, Sunlight Guest Hotel is set in Coron in the Palawan Region. The hotel features an outdoor swimming pool, an on-site restaurant and bar. Staff was wonderful and attentive! Located along the Coron-Busanga Road, Two Seasons Coron Bayside Hotel offers accommodations with views of the sea, 3.1 mi from Kayangan Lake. Guests can enjoy meals at the in-house restaurant. This was the best and friendliest hotel I have ever stayed at. Prepare your legs!! And bring lots of water as this one is really tiring as you need to walk up 700 steps to get to the peak of mt Tapyas..but once you get there, all the tiredness and sore muscles will be worth it! Best to go here at around 5pm to watch the sunset. After the trek and all the walking, go straight to Maquinit hotspring to have a dose of relaxation from all the walking.